Among its other attractions. New Orleans (where I happen to be at this moment of writing) is a city blessed with street and avenue names that are both unusual, particular to the city, and glorious: Basin, Burgundy (accent on the gund), Calliope (three syllables), Desire, Dryades, Felicity, Frenchmen, Poydras, Prytania, Rampart, and of course Tchoupitoulas. Just a few to get the conversation started. These names are elegant. No wonder I suffer from a desperate inferiority complex concerning the names of the streets on which I've lived. East 9th Street, West 91 Street, 9th Street, 10th Street. Designations without character -- gray and boring. No resonance, no power. Bland. Of course it hasn't been all bad: I once lived for a transitory summer (1961) on Snyder Hill Road -- a semi-poetic name that gestures at rurality. I knew a guy who was raised on Old Oaken Bucket Road. I was initially dazzled -- until I learned that his neighbors had petitioned the city for a name change -- his street had formerly been called Third Avenue or Smith Road or something of that ilk. So it was not a real name -- it was pseudo-historical kitsch. What suburban pretension! What a comedown! I'd have blushed with embarrassment if I had to admit that I lived on Old Oaken Bucket Road. It's almost as bad as Christmas Tree Drive (a real street in Boulder, Colorado, to the everlasting disgrace, nomenclature-wise, of our city). But now in this latter end of my life, I've achieved onomastic eminence. For half the year I live on Walnut Street, a name that is the epitome of small city authenticity (though it would be slightly better if there were an actual walnut tree anywhere nearby). And of summers I'm at Hackett Hill Road, which is just perfectly titled, and even more perfect because there are numerous Hacketts in our local cemetery and because, fifty years ago, I met aged Edna Hackett, the last survivor of the family that gave its name to hill and road. "One of the features at the Montauk Club's 50th anniversary dinner tonight will be the lyrics written by Dr. J. L. McAteer. The genial dentist wrote all the lyrics for the show and they are expected to be quite something." I have to confess that although I spent the first 17 years of my life in Brooklyn, I had never heard of the Montauk Club. But it exists! It was formed in 1890 and it's still there -- housed in a fancy Venetian Gothic building in Park Slope. But it's not the Montauk Club that's the subject of this paragraph -- it's the "genial dentist" and lyricist J. T. McAteer who has quite something in store for us. "Around the Town" continues: "Dr James McAteer is the dentist for the Brooklyn Baseball Club and examines the teeth of each and every player on the club. Seems that Business Manager Larry McPhail is fussy about it and insists on x-rays at least once each year. As far as McAteer is concerned, infielder Cookie Lavagetto has a perfect set of teeth, while good ones are owned by pitcher Van Mungo and infielder Johnny Hudson." So now we know. Cookie Lavagetto had perfect teeth! What a revelation. Information that has been hidden for 80 years. Everyone knows that Lavagetto broke up Bill Bevan's 1947 World Series no-hitter with a double off the Ebbets Field scoreboard. But who knew a damn thing about his choppers? This is neglected news of historic proportions. And it makes a guy wonder about the other players on the team (aside from those with semi-perfect teeth -- the legendary Van Lingle Mungo and unknown-to-me Johnny Hudson). Were other Dodger teeth cavity-filled, crooked, misshapen, stained with tobacco juice, busted, false, even missing. No wonder the '39 Dodgers were so bad. Twenty-five players and only three to write home about, teeth-wise. So here they are, the fabulous teeth of Cookie Lavagetto, bright and shiny, glistening at us over the years (I'm sorry but I couldn't find a picture of Cookie's molars). Lenore Coffee, born in 1897, wrote 50 or more silent films and any number of studio productions in the 30s, 40s and 50s. Her most notable achievement at Warner Brothers was the Oscar-nominated screenplay for Four Daughters, co-written with Julius J. Epstein in 1938. Epstein, with his twin brother Philip and Howard Koch, wrote Casablanca. Four Daughters is not on Netflix and not conveniently available, but I'll continue to search. Here's Lenore Coffee. Lightning Strikes Twice starts out as though it will center on Richard Trevelyan (Richard Todd), who has just been released from prison after a jury failed to convict him for the murder of his then wife, one juror dissenting. But it rapidly becomes Shelley Carnes' (Ruth Roman) movie. It's refreshing to see a film in which a strong woman shows "agency" but I have to admit that it is a little disappointing when she falls under the romantic spell of Richard Todd, who is supposed to be charismatic and sexual but who to me is an unappealing block of wood. Trevelyan's guilt or innocence is the nominal subject but the film focuses on the struggle between two women (Ruth Roman and Mercedes McCambridge) who seek his affection. It's a noir-y melodrama with a startling conclusion. Sudden Fear is the stronger of the two films. Once again, a conflict between two women: Joan Crawford, a rich successful playwright, and Gloria Grahame, an on-the-make unscrupulous hoyden. This time the hypotenuse of their triangle is Jack Palance, who is more expressive than Richard Todd could ever be, and a heck of a lot scarier. 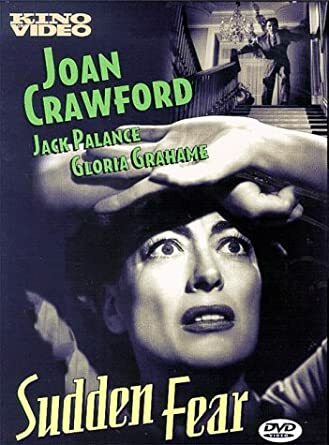 Joan Crawford has some fine moments: when she realizes that she's been duped by a gold-digging husband who plans to murder her, she registers terror, thoughtfulness, resistance and finally resolve using only her eyes. Unfortunately her intricate plan to save herself goes awry. There are some unanticipated and surprising twists in the complicated plot. My guess is that the censors intervened between the author's original conception and the eventual portrayal, in which Palance and Grahame are disposed of in such a way that Crawford is left without responsibility and without guilt. I would have been much more satisfied if Coffee had let Crawford kill her antagonists with that neat little silver revolver. Revenge would have been all the sweeter. This picture, young 'uns, is a washboard. You might have seen such a thing in an antique store or a museum. The washboard (this one is glass, like the one I remember from my childhood, but they also came in wood and metal) sat in the "laundry sink," which was filled with hot soapy water. You scrubbed your clothes on the washboard. It might be hard for you to believe, but when I was a youngster there was no such thing as a washing machine. It came later -- in our house, sometime in the early 50s, just a little after the refrigerator replaced the icebox. The washboard was cutting-edge technology in the 40s. What was a "laundry sink"? In our house, and I think in most regular-people homes, the kitchen sink had two parts -- a shallow basin for everyday use, and a second basin, deeper and wider, for dirty clothes. In some houses, the laundry sink was made of soapstone or concrete, but ours was porcelain. Every Thursday was "wash day," which meant that my mother spent the entire day, dawn to dusk, doing the laundry, sometimes with the help of a hired "colored woman," and sometimes with the help of her mother, my grandmother, who lived around the corner. It was a two-person job. Clothes were soaked, scrubbed on the washboard, rinsed, squeezed, then hung on the outside line to dry. Then, after a few hours, taken down and ironed. Sheets and pillowcases, if I remember correctly, were washed every week; blankets periodically. It was an arduous task, but I don't think anyone ever recognized how hard it was. It was just the way things were. Women, as everyone knew, did laundry. I know that I never thought to lift a finger to help, though I wonder whether, if I had had a sister, she would have been expected to do so. Certainly, I never saw my father participate, not in the slightest. If my mother ever complained, she never did so in my hearing. "Wash day" customs were immutable, or seemed to be so. Gender relations in the world of my youth were criminally unequal. Embarrassing to recall even now. 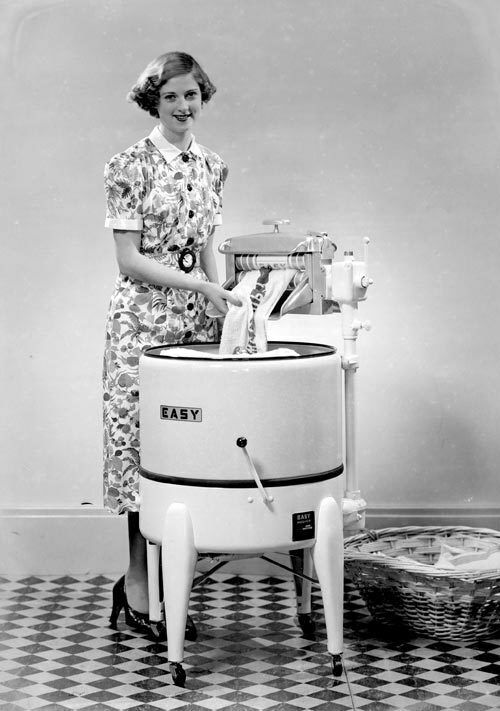 Then, sometime around 1950, came the wringer-washer. Now more hand scrubbing. Clothes were washed in the tub, then fed through the mechanical wringer, which consisted of two rubber cylinders turned with a crank. The pressure squeezed out the water, eliminating the need for hand wringing. It was a great step forward. In our house there was a wringer washer, portable, that had to be wheeled into place and connected to the kitchen faucets. It was a scary machine because a child had to worry that his mother's fingers would be accidentally wrung. Sometime later (I can't remember exactly when) came the washing machine with a spin cycle. I remember that when I worked at the Sears Roebuck warehouse starting in 1957 that we delivered many of them, so they must have appeared hard on the heels of the brief flowering of the wringer washer. In retrospect, I don't think there's a machine that contributed more to the revolution in housework and therefore the revolution in women's work and status than the washing machine. This morning I did my laundry. Two minutes to put the dirty clothes in the washing machine and another minute to transfer the clean clothes into the dryer. That's it. Let us therefore pause to appreciate the luxury and convenience of the contemporary laundering. And let us pause also to appreciate our hard-working mothers and grandmothers.